A 24-21 win over Dacula by his Rams, which earned him the TD Club of Atlanta’s nod as coach of the week, upped the program’s record on the year to 4-0, only one game behind the longest win streak of the school, which opened in 2009, but did not enjoy its first winning season until Pritchett’s first season at the helm, when that unit won its last five games of the year, yet failed to make the state playoffs. But until the victory over Dacula of late, that team had the program’s biggest win in its eight-year history, a 32-28 win over Mays, which began that five-game winning streak, which, to date, has not been equaled. Recalling that 7-3 season campaign, which ironically followed a winless season for Pritchett the year earlier at Westlake, he remarks, “That team had a lot of seniors, six D-1 players on that team. It just needed a coach to take them over the top.” At Arabia Mountain today, he does not have that kind of talent. Pritchett readily concedes that he has no D-1 prospects, “but some mid-major guys, four or five, and three to four D-2 or D-3 guys.” Yet, coming off back to back 4-6 seasons from 2014 and 2015, the Rams are obviously doing more with less, so to speak. In fact, Arabia Mountain now finds itself ranked among the elite in the ranks of Class AAAAA, where it is ranked No. 8, its first time to be listed in the AJC’s state rankings. One reason, Pritchett says is because “my kids are resilient. The biggest thing is that the senior class has really bought in to what we have asked of them. They have made a pack and they are determined to make this a special year.” That means, first and foremost, making the program’s first trip to the state tournament. 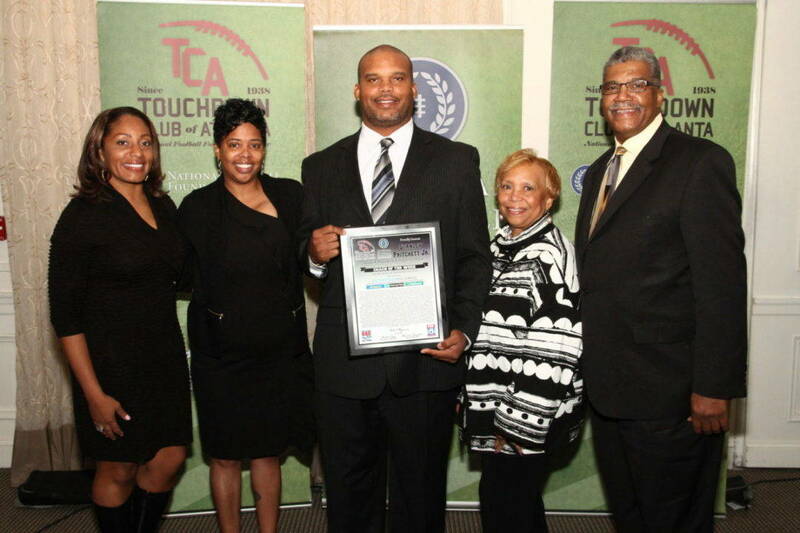 So far, Pritchett, who is only the third person to be honored as a player by the TD Club (Douglass of Atlanta, 1991) and also be cited by the 78-year-old organization and recognized later in his career as a head football coach, figures he has seen somewhere close to 35 of his former players go on to earn college football scholarships. And perhaps some will even go on and play in the NFL as he did, when coming out of the University of South Carolina in 1996, as a fourth round pick (118 overall), Pritchett began a nine-year pro career that included stops at Miami, Philadelphia, Chicago and Atlanta, his last stop in 2004.